If someone asked me to define elegance, I would have to toss out other words like simplicity and restraint, covered with a kind of luxury that has nothing to do with pretentious opulence but everything to do with exquisite comfort. It’s a hard sell in our over-the-top world, but I think there is a yearning to return to that kind of old-fashioned mystique. And the reopened Jefferson hotel, debuting after a 30-month renovation, is a breathtaking example of elegance, lovingly presented with true beauty. Think I’m exaggerating? Well, I’ve taken plenty of photographs for you to see for yourself. While touring The Jefferson, fellow author Cathy and I were spinning around like tops, ooo-ing and aah-ing every little detail. And there are many – the Beaux Arts hotel was specifically renovated by design firm ForrestPerkins to evoke the Jeffersonian spirit. He’s everywhere, but in a refined way, nothing kitschy at all, oh no. Perhaps it’s the next best thing to being in Monticello – which features prominently in murals and custom toiles – even the spa’s “vinotherapies” pay tribute to Jefferson’s philosophies and interests. But why are locals going to go? For two reasons – Quill and Plume. Quill is the whimsical name for the main bar, and it has a very eighteenth-century gentlemen’s club feel, lots of texture – even a wall lined with antique maps detailing Jefferson’s tour of wineries when he was studying up how to grow grapes in America. 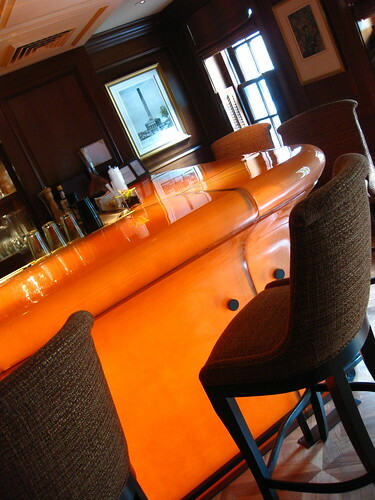 But the signature stunner is the bar itself – molded glass lit like an amber jewel. It’s a retro surprise. I can’t wait to cuddle up here and see what Alex Holzer has in store for cocktails. Coming from Rome’s La Pergola, he’s promising such concoctions as the Zero Eight – rosé vermouth, white grapes, angostura and champagne. Um, yes please. 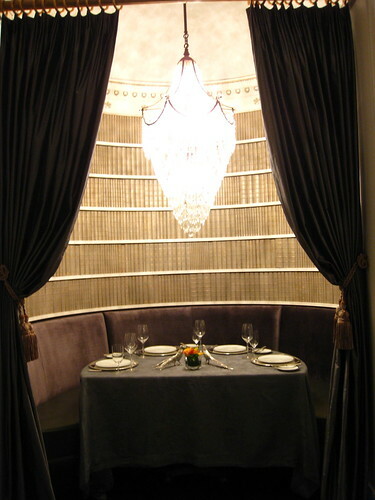 Cathy and I went a bit giddy when we discovered the menus for Plume, as we were wandering through its exquisite grey and white silk-lined dining room. I’m not sure I’ve ever seen John Dory on a DC menu before – very excited to finally try this odd-looking fish! Award-winning chef Damon Gordon will continue the Jeffersonian theme with a menu highlighting the tradition of Monticello’s gardens. Gunpowder Tea Smoked Organic Shrimp served with fennel confit, arugula, sea urchin and citrus granite – gosh. Caramelized Veal Sweetbreads with seasonal summer mushrooms, chervil and light vanilla velouté – faint. Can’t wait to try all this, hopefully in the corner half-moon booth with its own dripping chandelier and privacy curtains. The main question my girlfriends have been asking during the long wait for The Jefferson to reopen has been – what about the tea? 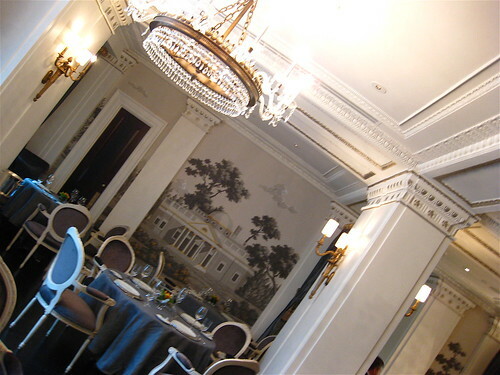 Afternoon tea in DC has been on the decline for a while now, and we always held the Jefferson up as an example of how to do it right. I’ve been assured the tea service will live up to its past. 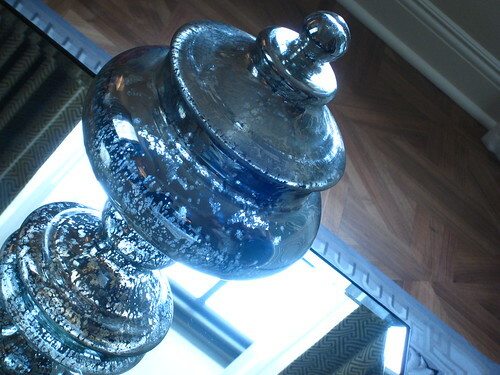 The Greenhouse will serve breakfast (three words – Lobster Eggs Benedict), lunch and tea under the recovered glass atrium specially lit, and it’s a beautiful delicate spot with nooks and fountains, perfect for a girls’ outing. Another spot for drinks and perhaps tea is the Book Room, paying homage to Jefferson’s love of books and featuring copies of his library editions. 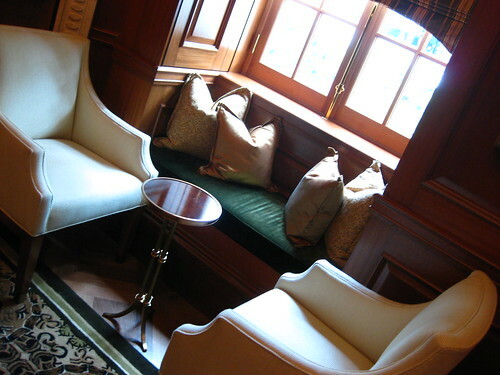 I loved this room and its relaxing warmth – like cosying up in a cashmere sweater. Here is where the idea of feeling like you are a guest in Jefferson’s private home really rings true. 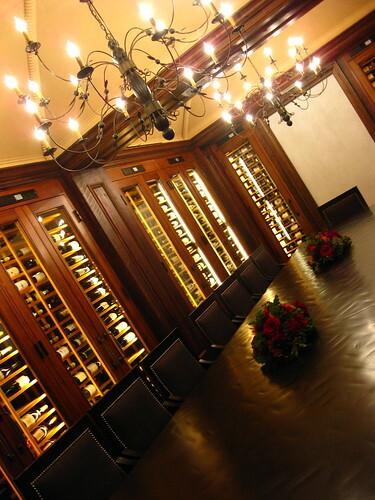 There are several meeting spaces in the hotel, including two small “cabinet” rooms intimate enough for the Washingtonian power broker, but my favorite was the Wine Cellar, glowing with wine bottles, long wooden table, and a replica of Jefferson’s dumb waiter invention. Birthday party, anyone? I have a mania about old hotels, and could go on and on about this one. Having loved the original Jefferson and waited eagerly for its reopening, I’m pleased it’s turned out so well. The details are so lovely, really, that I can easily see scheduling a staycation and staying in one of the restful suites, being pampered at the spa, pretending I’m a visiting VIP. Speaking of those, if you handle them, this is the place to set them up. Guest rooms are perfectly designed to be restful, and the personal touches are top-notch. It’s an old-school style reinvented for modern convenience, an intimate hotel with just 99 rooms. And, green housekeeping! So, either escape from the world in the Spa Suite, catch up over civilized afternoon tea, dine decadently, or drink divinely. It’s all true elegance, run by a staff that clearly loves the hotel. A welcome back to The Jefferson, beauty with restraint. We’ve missed you. Looks beautiful–I can’t wait to go! 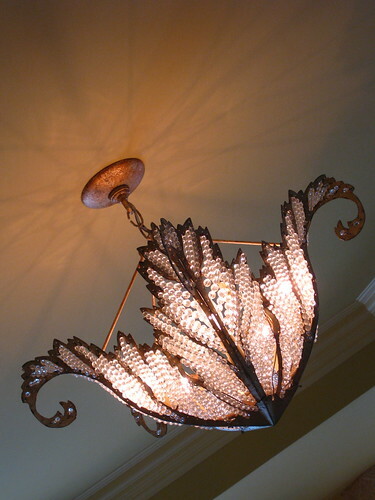 I loved your article and am delighted that you love the Jefferson! 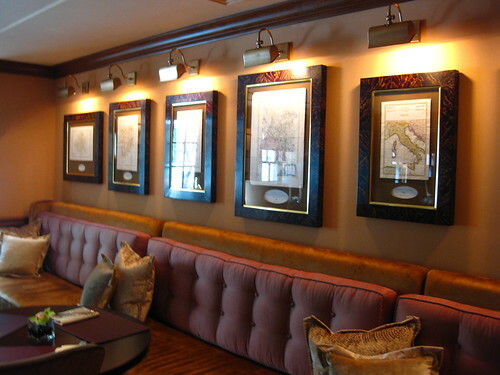 I am the art dealer for the vast majority of the art and hand made custom frames used in the hotel. I worked with Forrest Perkins for 3 years to complet this project. I have been coming to DC for 20 years with an art show twice a year. I will be in Washington for the entire month of September in a suite at the Willard Hotel with an amazing art collection and would love to invite you to attend. 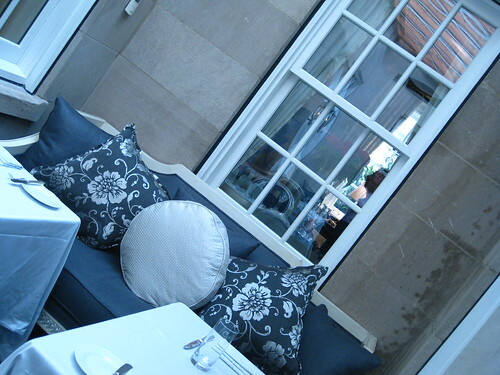 I do work by appointment only (7 days a week) and you can contact me at the Willard at 202-628-9100.